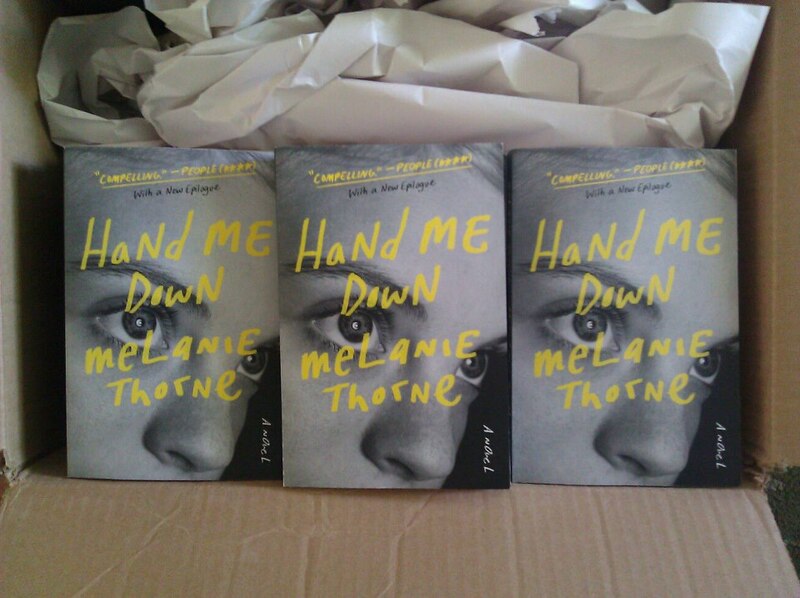 The paperback of Hand Me Down comes out in three days! Have you seen her new beautiful face? Despite being unsure of it at first, I have now grown to love this cover as much as—or possibly even more than—the hardcover. I hope new readers out there will want to pick up the book and hold it, that they will choose it off a shelf at a bookstore and take it home with them. Books just want to be loved, and I hope that all of you who enjoyed Hand Me Down in her first incarnation will tell your friends that she has been reborn. And that she is now cheaper! Though her price is not a reflection on her character. Her insides are still the same despite the new and less expensive exterior. Also, the paperback has bonus material! I don’t know of any other novel that has added material from the character rather than the author. In this case, a new epilogue that is an essay Liz writes for her creative writing class featuring Liz and Jaime and their family ten years later. So many readers have written to me and asked for a sequel. This epilogue is not exactly a sequel, but if you wanted to know more about what happens to the girls after the events in HMD, here’s your chance. You can preorder the paperback now from your favorite book retailer. Or wait until next week when you can pick it up in person at a bookstore. Or, you can enter this Goodreads giveaway for a chance to win one of ten free copies. Another fabulous book blogger, Book Magnet, posted this thoughtful and kind review. The blogger, Jaime Boler, even spells her name the same way my Jaime does, which is not that common. She says all kinds of wonderful things about my book, including, “Thorne’s story left me indignant and emotionally spent, which is proof of the author’s skilled writing and adept characterizations,” and, “Thorne leaves readers with white knuckles as they wait to see if Liz and Jaime survive and even thrive…If you enjoy books narrated by strong teen girls, wise beyond their years, then Hand Me Down is a must read.” Generous as she is, she has also invited me to do an interview with her on her blog which will be coming soon! I’m so grateful for these reviews, for all the reviews on Goodreads and Amazon, for being featured on She Knows Red Hot March Reads list, for all the emails and Tweets and Facebook posts…it’s a great way to kick-off the paperback release week! Hopefully this is just the beginning of a long and healthy paperback life for my baby. The Nervous Breakdown is an online community full of great reviews of books and movies, author interviews and original essays, and all kinds of cool content. As a writer, my favorite feature is their self-interview, in which authors interview themselves. Often authors do fun things like taking on different personas for interviewer and interviewee or asking inappropriate, off-the-wall questions, and/or use it as a chance to talk about topics that haven’t come up in other interviews or other things they find interesting. I’ve been a fan of these for a while so it’s such a pleasure to get to do one myself to celebrate Hand Me Down‘s rebirth in paperback. I’m pretty proud of this interview, actually, and it was tons of fun to work on. So I hope you’ll check it out. I start by calling myself a chicken and a liar, and it gets better from there. I also talk about forgiveness and Christopher Pike and seeing my flasher ex-stepdad on the local news. Well, I am a writer. But this is a strange way to begin an interview. Can’t you be nicer to yourself? Why didn’t you just call your book a memoir, chicken? Were you too scared to put yourself out there and be honest? Hand Me Down isn’t a memoir. It’s a novel. The Nervous Breakdown has also posted an excerpt from Hand Me Down—chapter one in its entirety. Enjoy! 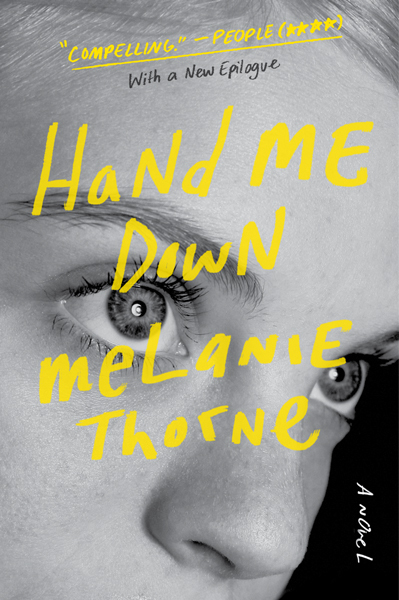 Hand Me Down’s New Paperback Face! Eye-catching, isn’t it? Striking, right? I think it really pops in a way that will get people to pick it up, and the thumbnail stands out online, too. My favorite part is the moon in her eye. Plus, the paperback has bonus material—a new epilogue that I’ll talk more about later, but is pretty exciting, since this isn’t something you get in a lot of books: a little extra from the characters at the end. I’ll be updating the site with the new cover image, more info about the new epilogue, and new upcoming events, so stay tuned! Kirkus Reviews Names Hand Me Down as One of the Best Fiction Books of 2012! When I was waiting for reviews, I nursed a secret little hope that Hand Me Down would receive at least one starred review. Hundreds of books release each year, and they can’t all get a star, but HMD did, and I was thrilled. It was a bit of a surprise that it came from Kirkus Reviews which is known in the industry for being, shall we say, harsh. But the reviewer at Kirkus understood Hand Me Down, and I was so grateful for the positive words and a glowing endorsement: the blue star next to the title. Never did I expect that my debut novel would make it onto a best of the year list! It was not something I even hoped for but now that it has happened, I couldn’t be happier. How cool is it to be included on Kirkus Reviews’ best fiction of 2012 list with names like Ron Rash, Gillian Flynn, Michael Chabon, Richard Ford, Lauren Groff, Sherman Alexie, Alice Munroe, Dave Eggers, Junot Diaz, Elie Wiesel, fellow Book Pregnant members Wiley Cash and Stephen Dau, and so many more talented and deserving authors, many of whom are famed literary greats. Seriously, did you see that list of names?! It is amazing to have my labor of love appear alongside these established, award-winning, crazy famous authors’ books. It’s not just my debut up there next to the works of literary masters, but other first-time novelists made the cut and I’m thankful to Kirkus Reviews for giving the newbies equal weight. And, on Hand Me Down‘s review page, they’ve added a gold medal that says “Best of 2012.” I wish you could see how much I’m smiling. It’s so exciting! This, among many other things, is something to be thankful for this year. I hope you all had a lovely Thanksgiving weekend! Hand Me Down on Good Morning Texas! So, Hand Me Down made her TV debut last week on Good Morning Texas. Sometimes I’m still so in awe that I even HAVE a book out there, you know? This was one of those moments. I was so proud seeing her up there with those other books, in a real live TV studio, with the book-savvy Gwen Reyes of Fresh Fiction talking about how great she is. “Perfect for fans of Jodi Picoult,” she said. Why, thank you. I was happy it was my book up there representing us on our first TV appearance, looking all cool, calm, and collected, instead of me, who would have been sweaty and nervous. My book baby is still so pretty. I suppose all new mothers think that, right? She’s almost six months old. Can you believe it? Anyway, check out this segment of Buy the Book on Good Morning Texas. Hand Me Down gets mentioned around minute 2:47, but the other books sound interesting, too. I’ve added several of them to my TBR list.